1. A vehicle other than class LE is not fitted with one pair of dipped-beam headlamps. c) two pairs of main-beam headlamps. 3. A vehicle other than class LE is fitted with a headlamp that is not in a pair. 4. A vehicle of class LE is not fitted with one dipped-beam headlamp. b) does not meet the conditions of the lighting equipment endorsement in its vehicle identity card. 7. A device that allows the headlamps to flash alternately is fitted to a vehicle that is not an emergency vehicle or a pilot vehicle. 8. A vehicle is fitted with a dipped-beam headlamp where the maximum intensity of the beam is projected to the right. 9. A lamp is insecure, obscured, or contains dirt or moisture in the form of large droplets, runs or puddles. 10. A lens is missing, or has a hole, crack or other damage that allows moisture or dirt to enter. 11. A lens or reflector is damaged or has deteriorated so that light output is reduced. 12. A main-beam headlamp warning device is obscured from the driver’s vision. e) too bright, eg due to the fitment of an HID conversion kit (Note 8) or other incorrect light source. ii. as specified in Table 4-1-1.
h) a main-beam headlamp warning device does not indicate to the driver that the main-beam headlamps are switched on. iii. at a varying frequency. 17. Where a headlamp comprises an array of light sources (eg LEDs) fewer than 75% of these operate. 18. A headlamp is retrofitted with a type of light source other than that specified by the vehicle manufacturer or the headlamp manufacturer (eg a headlamp designed for a halogen bulb is fitted with any other type of light source such as an HID or LED bulb, or any other light source such as LED strips or non-OEM angel eyes) (Note 8). c) as far towards each side of the vehicle as is practicable. 20. A retrofitted dipped-beam headlamp on a vehicle with a GVM of 12,000 kg or less is positioned at a height exceeding 1.2m from the ground (Note 9). An original equipment (OE) lamp is one that is fitted by the vehicle manufacturer in the original position, or is an equivalent replacement or aftermarket lamp suitable for the position provided by the vehicle manufacturer for that lamp. All other lamps are considered retrofitted (ie non-OE). If the dipped-beam headlamps are able to be adjusted from the driver’s seating position, the alignment must be checked with the adjustment at its highest position. If the vehicle is fitted with self-levelling suspension, the alignment must be checked with the suspension at its normal level. c) combination of a dipped-beam headlamp and a main-beam headlamp (dual-lamp unit). Dipped-beam headlamp means a headlamp that is designed to emit a dipped beam, which is a beam of light that is angled downwards in such a way that it prevents undue dazzle or discomfort to oncoming drivers and other road users. Main-beam headlamp means a headlamp that is designed to illuminate the road over a long distance ahead of the vehicle. If a headlamp is fitted with a readily removable cover, other than a clear protective cover, this must be removed for inspection of the headlamp. A vehicle originally manufactured with a headlamp arrangement that differs from what is required or permitted in this section may retain the original headlamps provided they remain fitted in their original position and perform as intended by the vehicle manufacturer. A forward-facing permitted lamp that does not comply with the equipment, condition and performance requirements must be made to comply or be removed from the vehicle. A high-intensity discharge (HID or Xenon HID) conversion kit consists of an HID bulb with a high voltage power output or ‘ballast’ which fits into the original headlamp unit in place of the original bulb with no change to the headlamp lens, reflector or housing. It is illegal to fit an HID conversion kit to a vehicle as it brings the headlamp out of standards compliance by producing poor beam patterns and light that is far too bright to be safe. The bulbs can also produce light that is noticeably blue and not the required substantially white or amber colour. Vehicle and headlamp manufacturers do not permit this modification, and these kits cannot be LVV certified. It is permitted to replace a complete halogen headlamp unit with a complete HID or LED headlamp unit. If the vehicle is required to meet an approved safety standard for headlamps, only approved headlamps can be retrofitted (see Figure 4-1-1). The dipped-beam headlamps may be positioned at a height exceeding 1.2m if a road maintenance implement (eg, snowplough or roadsweeper) fitted to the front of the vehicle would obscure headlamps placed at a height of 1.2m or less. It is acceptable for a pair of dipped-beam headlamps to consist of one symmetric and one asymmetric dipped-beam headlamp. However, in some cases this may result in one lamp being noticeably brighter than the other lamp in the pair. In that case, the vehicle inspector may determine that the dipped beams differ noticeably in light intensity, and the lamps fail the inspection. Note that a beamsetter’s luxmeter cannot measure the light intensity of a dipped beam headlamp. The following standard markings may assist in determining compliance with approved standards. vehicles of class MB, MC, MD1, MD2, MD3, MD4, ME, NB and NC manufactured on or after 1 January 1996. New Zealand Gazette, 28 August 1980, issue 103, page 2569.
b) may be fitted with one or two pairs of main-beam headlamps. b) may be fitted with one or two main-beam headlamps. b) may operate independently of the first pair of dipped-beam headlamps. b) the vehicle meets the conditions of that endorsement. 5. A vehicle required to meet an approved safety standard for lighting must continue to meet an approved safety standard for lighting. 6. A retrofitted dipped-beam headlamp on a vehicle with a GVM of 12,000 kg or less must be fitted at a height not exceeding 1.2 m from the ground (Note 9). 7. A warning device may be fitted that indicates that the main-beam headlamps are switched on. 8. An emergency vehicle or a pilot vehicle may be fitted with a device that allows the headlamps to flash alternately, provided it is also fitted with equipment that indicates to the driver that the device is activated. 9. A retrofitted pair of headlamps must be symmetrically mounted as far towards each side of the vehicle as is practicable. 10. A dipped-beam headlamp designed solely for a left-hand drive vehicle, where the maximum intensity of the beam is dispersed to the right, must not be fitted. 12. A headlamp must operate in a way that is appropriate for the lamp and the vehicle. 13. A headlamp must emit a steady light. 14. A headlamp must provide sufficient illumination and light output to illuminate the road ahead. 15. If fitted with a device that allows headlamps to flash alternately, the lamps must flash at a fixed frequency. 16. A pair of headlamps must emit light that is approximately of equal colour and intensity when switched on. 17. A headlamp must emit a beam that is substantially white or amber. 18. A main-beam headlamp must be capable of being dipped or turned off from the driver’s position. 19. A warning device that indicates that the main-beam lamps are in operation must be in good working order. iv. 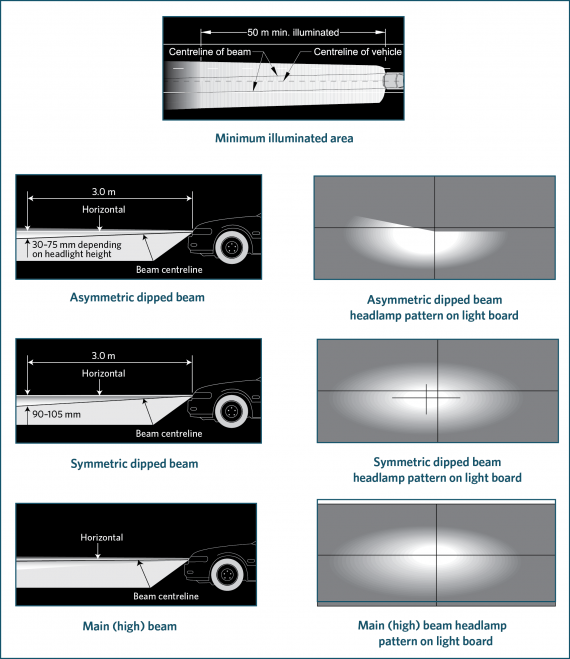 2–2.5% for an asymmetric beam pattern where the centre of the light source is above 1.2 m from the ground. 21. The dipped-beam headlamps must illuminate the road ahead for 50 m in normal darkness. 22. Where a headlamp comprises an array of light sources (eg LEDs), at least 75% of these must operate. b) incorporate equipment that indicates to the driver that the device is activated. 24. A headlamp must be fitted with a light source that is specified by the vehicle manufacturer or the headlamp manufacturer. 25. A headlamp that is affected by a modification must meet equipment, condition and performance requirements.